There is a lot of hype about the amazing health benefits of craft beer. When it comes to health, I tend to be a tinsy bit obsessive – what is the source of the information, what is the source’s agenda, how did the source get the information…So I devoted several days to research and read as much as possible on what science has to say about that craft beer-a-day. Evidently, craft brews can contribute to optimal health. At the same time, many of the health benefits that are so loudly touted have not been extensively researched or evaluated in conjunction with factors that could potentially counter them. A quick example. Craft beer, being an alcoholic drink and containing ethanol can lower the risk of cardiovascular disease. Thanks to a number of widely publicized studies most people are aware of this¹,². At the same time however, craft beer is a very high glycemic beverage, despite its relatively low carbohydrate content. This means that it causes a rapid rise in blood sugar levels (not a good thing) because it is absorbed into the bloodstream very fast¹. Furthermore, craft beer is made with grains and yeast – enter gluten allergies or sensitivities and yeast intolerances. What is a person to conclude? My current personal stance is that no firm conclusions can be drawn. While craft beer has been found to provide indisputable health benefits, it is important to balance its enjoyment with a healthy diet and a steady exercise routine. This seems to be exactly what most craft beer fans are already doing – read on for the results from a poll on this topic! Additionally, speaking from personal experience, people suffering from intestinal candida overgrowth should stay away from beer until such a time that they have cleared their body from the candida overgrowth and achieved a diverse microbiome. There is also a catch – any health benefits of craft beer are contingent on moderate consumption. I also noticed that most of the research concerning craft beer’s contribution to better health seems to have been conducted based on beer as a broader category with little differentiation between industrially brewed beer and smaller batch craft beers. Scientific research specifically focusing on craft beer is still nascent. Why is moderate consumption important? Drinking heavily is never a good idea no matter what the alcoholic beverage. When it comes to craft beer the health benefits accrue assuming moderate and regular consumption – neither several pints per day, nor the occasional craft beer now and then. 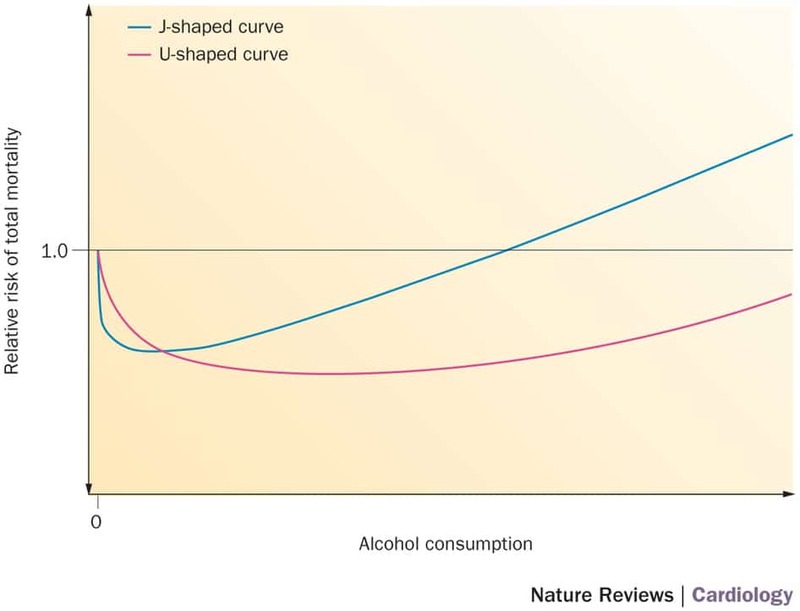 Consider the famous U-shaped and J-shaped curves illustrating the relationship between daily alcohol consumption and expected mortality. Those who maintained low to moderate alcohol intake during their lifetime had the lowest relative risk of total mortality, cardiovascular disease and type 2 diabetes among other ailments¹,²,³. But how much is low to moderate consumption? It is generally accepted that one 12-16 oz daily serving of craft beer constitutes moderate consumption for the average woman and one to two pints are about right for the average man¹. Note the use of the word average. I want to emphasize that factors like body weight and physique and the intensity of a person’s exercise routine can make a difference. Two pints a day could be too much for a smaller, sedentary guy and perfectly fine for a taller woman who works out intensely. Now I am wondering .. is this why T-shirts that say “I run because I really like beer” are so popular? Why is it important to distinguish between industrially brewed beers and craft beer? Mostly because the difference in the ingredients used under each brewing method accounts for a great deal of the resulting brew’s potential health benefits. Or lack thereof. Industrial brewing is all about cheap alcohol production. The focus is on cost cutting (at the expense of dulling the beer) and increasing the profits. I recommend reading the piece on page 28 of the The World Atlas of Beer, 2016 edition by Webb/Beaumont. The authors reference a special report sponsored by the European Union that described large brewers as ‘bankers who make beer’. Industrially brewed beer nowadays often consist of ‘mainly alcohol, sugar and bubbles’ according to the research of Webb and Beaumont. In large scale brewing the amount of malted barley used is minimized and ‘augmented’ by cheaper alternatives like GMO corn, rice, or even worse – high fructose corn syrup. Hops are reduced to a minimum, while added are preservatives and MSG, caramel coloring (since color no longer comes from the malted barley) and artificial flavorings. Craft beer on the other hand is all about the quality of the ingredients and the ethics of the brewing process. It’s about using both to create flavor experiences that are rich and rewarding. Craft brews are so satisfying that you simply drink less. They are designed with flavor as the end goal. Compare that to pounding several mass produced, flavor stripped beers and you will not only consume less calories overall going the craft beer route, but you will have no problem adhering to the ‘consume in moderation’ maxim. Craft beer producers take pride in driving flavors by using natural main ingredients (malts, hops, yeast and water) and the brewing process itself. To me, craft brew masters are artists. They do not rush things and frequently use a variety of natural conditioning methods to further flavor the beer. When compared with mass produced corporate beers craft brews contain a lot more of the key ingredients that are supposed to be in beer. These ingredients contain the very compounds that are the source of beer’s health benefits. Over the centuries the consumption of beer has not only lead to numerous health benefits – it can also be credited with saving lives. In the Middle Ages those who drank beer survived because harmful bacteria contaminating the drinking water were killed during the boiling stage of brewing. Those who drank water didn’t. I am quite confident that we all have wise beer drinkers somewhere in our family trees. Beer contains magnesium, potassium, selenium, biotin, chromium and phosphorus. It also has a lot of B vitamins (folic acid, niacin, riboflavin, B6 and B12)¹,²,³. Almost like taking a multivitamin! Joking aside, due to its nutritional content beer could help with the body’s metabolism, the functioning of the nervous system, muscle contraction, blood cell formation, cardiovascular disease protection¹ and even boost intestinal function and immunity. In fact, recent research has confirmed that beer contains prebiotics² – indigestible dietary fibers, essentially food for the good bacteria in your gut called probiotics. Prebiotics stimulate the health of probiotics in the intestinal tract. This Easy Yogurt Dip contains both probiotics and prebiotics essential for your health. Here are some of the better researched examples. Beer contains polyphenols which are powerful antioxidant phytonutrients with anti-inflammatory and immune system benefits¹,². Both malt and hops are sources of beer polyphenol substances, however most of them (70%-80%) originate from the malt¹. In industrial brewing, polyphenols are frequently filtered out as they can contribute to haze, which many consumers are conditioned to not appreciate in beer. In contrast, craft beer is rich in polyphenols as both more malts and more hops are used. Hops, which were originally added to beer to bitter the sweet taste of the fermented wort are also what stabilizes and preserves beer. Today they are credited with possessing cancer preventative properties. Hops contain xanthohumol, which has been found to suppress carcinogenesis (initiation of cancer) as well as to block cancer progression. The best part is that human exposure to xanthohumol is primarily through beer consumption¹,²,³. Another substance contained in hops, humulone, has been shown to inhibit tumor progression (by preventing the development of new blood vessels needed for tumor growth¹). Craft beer contains a lot more hops than industrial lagers. A lot more! Nowadays, especially with IPAs being the most popular style in the USA, it is not uncommon for ten to up to thirty times the standard amount of hops to be added to IPA styles. Ever tasted a triple IPA that literally made your tongue numb? For a long time, before any scientific research had proven it, hops have been known to alleviate anxiety and insomnia. Today it has been shown that they have a central sedating effect that accounts for increased sleeping time¹. Hops promote relaxation and healthful sleep by way of raising the levels of the neurotransmitter GABA (γ-aminobutyric acid). A resin from the female flower of the hop plant (Humulus lupulus L.) is what accounts for this relaxation inducing mechanism¹,². Even non-alcoholic beers can help with winding down from stress and staying asleep, as shown by a study involving stressed university students¹. Natural pharmacists alike have tapped into the relaxation promoting properties of hops by making hops pills meant to soothe the nervous system and promote deeper and longer sleep. In addition to helping menopausal women achieve higher quality sleep, hops in beer can alleviate other unpleasant symptoms related to the condition. They release a substance called 8-prenylnaringenin. It is related to xanthohumol and is considered to be the most potent phytoestrogen known to date. The substance has performed so well in alleviating menopausal symptoms such as hot flashes that research is underway to determine if 8-prenylnaringenin can be used in pharmaceuticals to prevent and treat the unpleasant symptoms by balancing the estrogen levels in the female body¹. Another symptom attributed to the hormonal imbalances of menopause is osteoporosis and hops have been shown to help with this too. 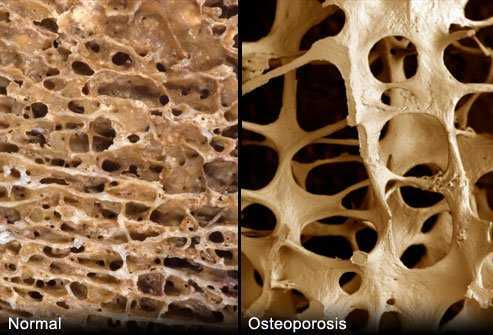 Osteoporosis entails the deterioration of bone tissue and mass and results in increased susceptibility to fractures. Osteoporosis is not limited only to women in their menopausal years as men are frequent sufferers as well. The bone structure of those affected becomes more porous as seen below. Moderate consumption of beer has been shown to improve bone density in two ways. The phytoestrogens discussed above are one of them¹,². The silicon content in beer is another one. The malts in beer are the source of bioavailable silicon which the human body can absorb much faster than silicon coming from a food source such as a banana for example. Silicon is essential for bone structure as it contributes to bone density¹. Beers that are rich in barley malts and hops contain more silicon than these that do not. 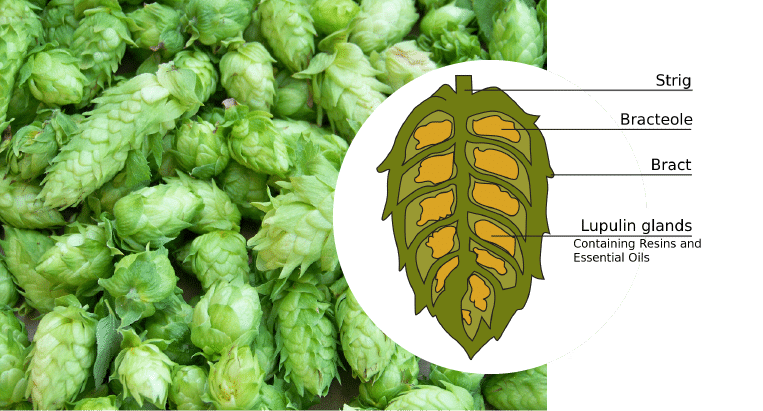 Hops contain more silica than what is provided via the husks of barley malts, but the use of hops comparative to the use of malts is smaller in brewing, so both ingredients are necessary to reach a higher average silicon content¹. Beer consumption has been shown to stimulate gastric acid production in the stomach, which is associated with better digestion of the food and control over harmful gut bacteria. There are different organic acids in beer responsible for this effect, but the most important role was attributed to the bitter alpha, beta and iso-alpha acids derived from hops¹. Additionally, certain beers can improve the gut flora by bringing in more beneficial microorganisms. These are known as spontaneously fermented beers. They originated in the Senne river valley, near Brussels, Belgium. The ones made there, near the town of Lembeek are called lambics. The wort is poured into shallow cooling vessels called coolships and left to cool off overnight, completely exposed to the local microbial flora. Wild yeasts and bacteria inoculate the wort and shortly after it is transferred into oak barrels where the microorganisms begin a spontaneous fermentation. True lambics are almost exclusively made in Belgium and science is still uncovering their mysteries¹. They take a long time (1 to 3 years) to ferment and the end result is a large diversity of gut beneficial microorganisms¹,². Lambics are different from sour beers in that there is no control over the fermentation. With sours, even though wild yeasts and micro flora are used, they are carefully chosen by the brewer and added in a controlled manner. Sour beers are the style mainly brewed in the USA, even though some breweries do follow the precise method of making lambics and rely on brew house resident bacteria¹. The Libertine Brewing Co. Aubree is one such example. Either way, spontaneously fermented styles/wild culture sour beers contain a lot of beneficial microorganisms. They are similar to Kombucha and kefir in the sense that they contain a symbiotic micro flora that can bring bacterial diversity to the human microbiome. Tim Spector, a professor of genetic epidemiology at King’s College London and a prolific researcher found that consuming Belgian lambics does not only have a very positive effect on gut health, but can even help with maintaining a slim figure. His book The Diet Myth explains the benefits of sours and dispels the myth that consuming less calories alone, or avoiding grains, or dairy leads to controlling weight. In addition to the fact that moderate craft beer intake can offer specific health benefits, its aficionados typically lead overall healthy lifestyles. Remember that poll I mentioned about the dietary and exercise choices of craft beer fans? It found that when compared to average beer/wine/spirits drinkers the craft beer enthusiasts drink less and take time off alcohol on a weekly basis, exercise more, read nutritional labels more frequently and more often seek out local food. Craft beer may not be an optimal choice for everyone, but it can certainly be integrated into a healthy lifestyle. The health benefits of craft beer come on top of the enjoyment of amazing flavors. What a great information!! I have to agree with the moderation part! I don’t care how healthy certain food/drink/ingredient can be, but one still needs to exercise moderation. 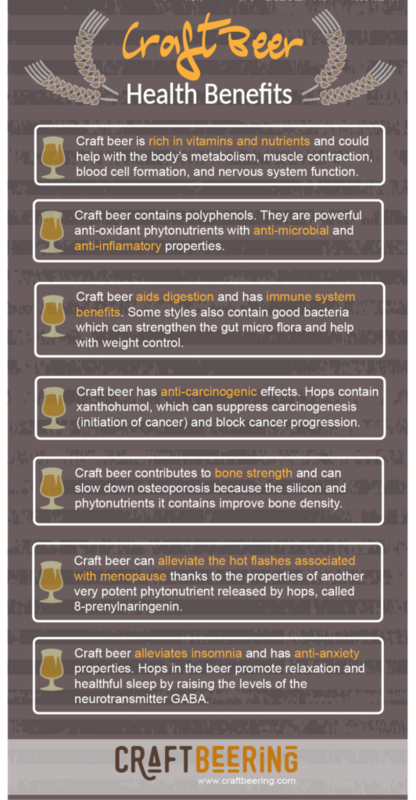 Now I know there are so many health benefits of Craft Beer too!! Yes! I agree – it seems that everything revolves around moderation in life.